On booting up Steredenn, I was immediately reminded of R-Type, which is definitely not a bad thing. This is a classic, two-dimensional scrolling shooter set in space and featuring a single ship tasked with eliminating an entire fleet of hostile alien invaders and their increasingly powerful overlord bosses. 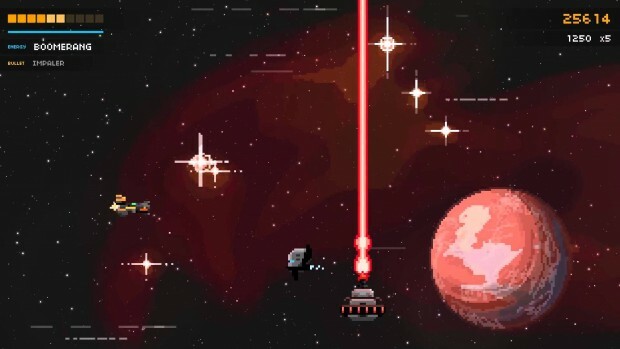 The lone ship, the blackness of space and the bad guys will all be immediately familiar to fans of the genre, but Steredenn features a unique twist: each playthrough is randomly generated in typical rogue-like style. This randomisation is both Steredenn‘s strength and its weakness, ensuring that it offers a stiff and unique challenge every time you tackle it, but also removing the aspect of pattern recognition, which is so often key in games of this type. The action is delivered alongside a pulsating soundtrack, and the variety of weapons and boss configurations makes for a reasonably varied experience for the first few hours of play. It isn’t long, however, before the randomness begins to feel repetitive, and the dull backdrops and lack of variety in enemy appearance begins to take its toll. 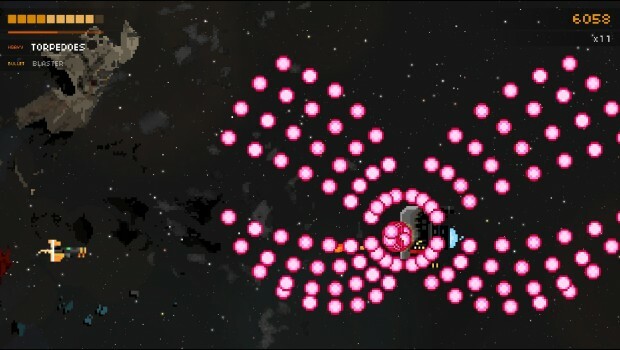 Classic design with a modern twist — I love classic, scrolling, shoot-em-ups like R-Type, and adding a unique twist such as those seen in various Treasure games like Ikaruga is a good idea. Steredenn‘s use of random enemy formations and strategies is generally very good, and it rarely feels cheap or unbalanced. At the end of each level is a boss, and although they get consistently bigger — and tougher — as you get deeper into the game, each enemy has a random combination of two or three weapons the player will need to learn (or remember from a previous encounter) and exploit. Special weapons are also randomised, and a minor downside here is that some are considerably better than others, so picking up a particular one can lead to considerable success or abject failure. Pulsating presentation — After a few hours of play, I did begin to tire of Steredenn‘s largely black and muted pastel colour palette. For at least a couple of hours, though, the punchy, direct soundtrack and classic feel really got my blood pumping and served to ensure I was fully engaged, which is excellent considering this is a genre requiring complete concentration from a die-hard audience of highly skilled competitors. True test of skill — I said before that Steredenn lacks the typical pattern recognition aspect that fans of side-scrolling shooters typically expect; intsead, it does do something else really well. The enemy patterns and weapons are memorable, so although each set of enemies in a sequence is randomised, it is possible to remember the behaviour of a given wave from a previous playthrough. Similarly, bosses each have two or three weapons or attacks that appear in random combinations, so as long as you can piece together the puzzle from an earlier encounter, you just might be able to overcome the odds. This mechanic actually works really well, as it gives a genuine advantage to dedicated, experienced players and ensures that the level of technical skill required for success is even higher than usual. Rapidly random — One issue with Steredenn that I’ve already hinted at came somewhere in the middle of my time with it. The problem occurred because I felt I had seen almost all of the randomised elements the game could throw at me, but I had perhaps not yet fully understood that learning how to make the best — and survive the worst — of the randomisation is so important to succeeding. You’ll have to grin and bear it for a while, but it’s just about worth it. Randomly repetitive — Some people are just going to find Steredenn repetitive, and at times I did too. Regardless of how a given wave of enemies behaves, it will always look broadly the same. Boss enemies are even worse, growing in size but not at all in characterisation. 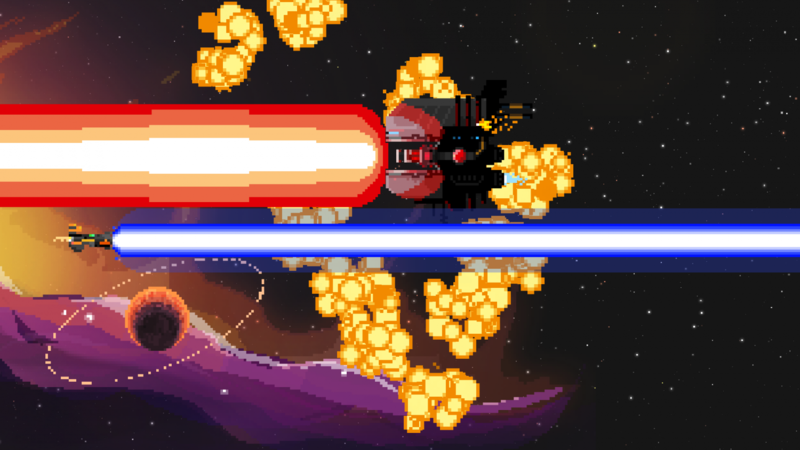 Most of the iconic side-scrolling shooters have a unique visual style, and the bosses are a particular highlight, but with Steredenn it feels a bit like it’s all business, with none of the nonsense that made me love games like Deathsmiles or Parodius. Flying solo — The biggest shame about Steredenn is that it is entirely single player, and although it features both a ton of online scoreboards and a really fun daily challenge that allows players to compete just once every 24 hours for the top spot, it would benefit from local and online multiplayer. Sterdenn is a solid shooter. It’s perfectly competent and features a really solid and completely unique randomisation mechanic that’s worth exploring. Outside that, it is a little repetitive, and beyond the first couple of hours I doubt it has the longevity to attract casual interest. I highly recommend it to leaderboard-chasing fans of the side-scrolling shooter, but anyone else is advised to use caution when considering investing their cash here. 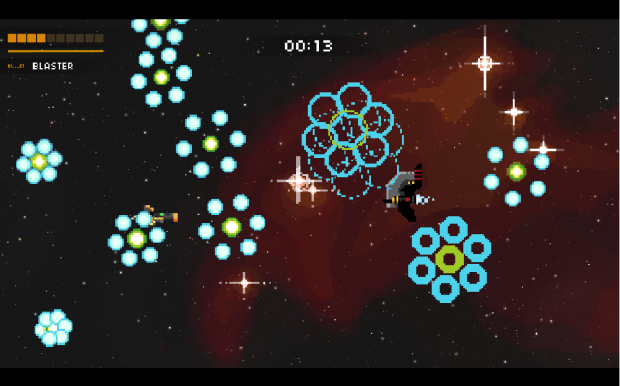 Steredenn was developed and published by Pixelnest on Xbox One. It releases April 1, 2016 for $12.99. A copy was provided by Pixelnest for review purposes. Click here for information on XBLA Fans’ new scoring system.